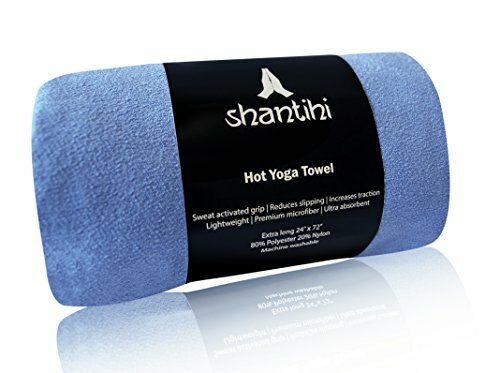 Shantihi Hot Yoga Towel - The Best Premium Yoga Mat Towel. Non Slip, Soft Absorbent Microfiber. Lightweight and Extra Long 72"x24". FREE Bonus eBook. Size: -- Choose Size -- Hand Towel 15"x24" Mat Size 72"x24"
Are you tired of slipping on your yoga mat, especially when you are trying to hold a pose during sweaty practices? You're not alone. Many yogis would prefer to focus on their practice rather than worry about an unsteady foundation. 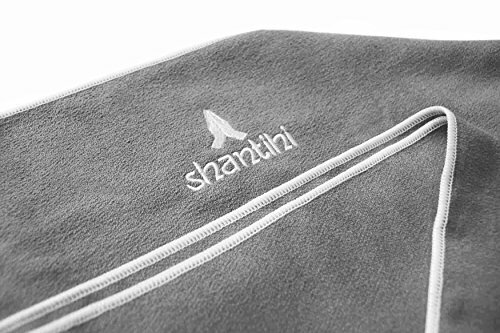 Shantihi, which means peace in Sanskit, was created to help people find a sense of stability and peace in their lives through the use of quality and eco-friendly yoga products. 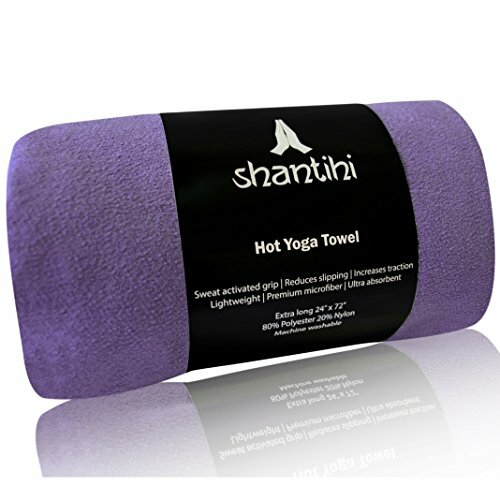 How will Shantihi Hot Yoga Towel help your practice? - Builds confidence to hold or advance your pose due to a solid, slip-free foundation. - Keeps you feeling cleaner and drier. - Peace of mind knowing that you are protected from other people's sweat and germs when using studio mats. - There are no silicon dots beneath our towel as it is unnecessary. The microfiber materials are designed to stay in place on the mat, giving you a more comfortable and grounded practice. - Great traction while you sweat. We recommend that you lightly spray your towel with water before use as the microfiber material works best when slightly damp. - High quality edge stitching gives it a premium look and feel, ensuring your towel doesn't fray. Save more when you buy multiple yoga towels. Click "Add to Cart" now to invest in a steadier practice and why not choose another color or size so you have a fresh towel for each class? Would make a great gift for your yogi buddy too! Note: Hand Towels are sold separately. Check out our other products for more discounts with purchase. 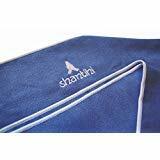 Search for Shantihi Yoga Mat or Shantihi Yoga Strap.  NON SLIP AND SKIDLESS : Gain more confidence and peace of mind with a solid, stable foundation especially in hot sweaty practices like Bikram, Hot Yoga and Ashtanga. Increased traction allows you to concentrate on holding your pose instead of worrying about injuries from slipping.  SOFT AND ULTRA ABSORBENT : Feel great on your mat. Our sweat activated, premium microfiber materials (80% polyester, 20% nylon) are designed to soak up excess sweat as you practice. Throw it in the washing machine with your other clothes and you are good to go. Dries super fast too.  EXTRA LONG SIZE, PERFECT FOR ANY YOGA MAT : Add life to your yoga mat with an extra layer of protection. 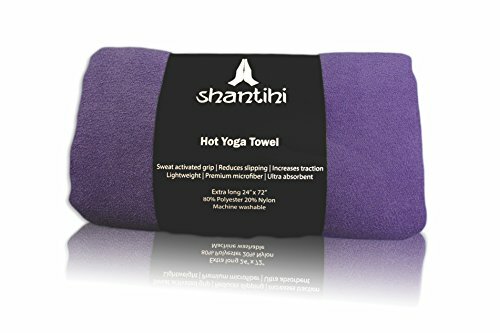 This 72" x 24" hot yoga towel is perfect for covering standard studio mats and other popular yoga mats such as our Shantihi TPE Eco Yoga Mat.  HYGIENIC, LIGHTWEIGHT AND TRAVEL FRIENDLY : Protect yourself from other people's sweat and germs! This lightweight hot yoga towel is easy to fold and carry to your yoga studio, providing a protective layer between you and the studio mat. It fits perfectly into your travel bag so you are ready for yoga wherever you land.  100% YOGI SATISFACTION GUARANTEE : Designed in New Zealand with love. 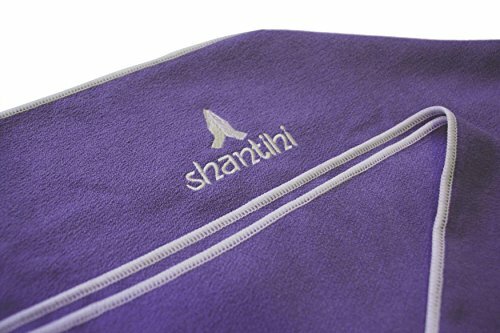 If you are for any reason unhappy with your Shantihi Hot Yoga Towel, we will provide a 100% money back guarantee. Please enjoy our FREE bonus "10 Best Restorative Yoga Poses to Relieve Stress" ebook with your purchase.